This thread is dedicated to the question regarding what you would like to see added or changed in Acronis True Image. Ekaterina, some things from me! For Differential backups to be totally independent of each other, not to behave as they do today as if they are were Incremental backups. Coupled to this change, provide an automatic cleanup option to remove unwanted Differential files similar to the current option to 'Store no more than X recent version chains', but without the need to start a new Full backup image. Provide the same Advanced Options for backups to the Acronis Cloud, i.e. the ability to use Pre / Post Commands, and to control Error Handling, plus an option to only run the backup when on a specified network connection (as available in Windows Task Scheduler). Bring back the ability to view Log files directly in the ATI GUI, even if this is by means of an extra option in the drop-down menu for each backup task, i.e. along with Open Location, Rename, Validate etc, include an option to View Log files for that task. Bring back the ability to look at all Scheduled task activity directly in the ATI GUI without the need to use the Acronis Scheduler Manager program with its ancient and obscure command line interface. Provide more options for task naming using such as DATE, TIME etc that users currently can only achieve by manually editing the task Script .TIB.TIS files. This ability should be provided within the ATI GUI instead of users editing XML files and risking corrupting them. 1. Grandfather, father, son scheme that allows for the use of mixed Inc and diff options in one backup task. For instance... 6 daily Inc, 1 weekly diff, repeated 4 weeks and then a full again. Like Steve mentioned above, diffs should be 100% independent of any other incremental or differential for any backup .tib navigation or recovery. 2. Include UR in the interface for easy access to download and have automatic update notifications when new versions are out. 5. Prevent all existing .tibs from adding to the console on reinstall by default. This is way too messy. Instead, ask the user if they want to include any locations to scan for existing .tib files and allow this to modified as needed to update new locations or remove existing ones. Ability to easily choose a backup scheme that alternates between multiple copies. I want to have a backup A, B, and C so that I can have a copy offsite, the current copy, and the copy that is next. Users should be able to configure backup tasks so they only run when the computer is attached to a particular network. I back up my Dell notebook both to my NAS and the cloud, however the former will give an error when I am on the road, and the latter results in the backup trying to run whenever I attach to a wifi network. Users should not have to use elaborate pre- post commends or scripts to deal with this issue. ATI is primarily directed to consumers who will not appreciate having to go through elaborate process, which they do not fully understand when configuring backups on their notebooks. I now resort to running backups manually to avoid the issues when I am on the road. I would like to see a good partition manager built into True Image tools. It should run standalone as well as from the Tools tab. It should be adept at moving partitions such as recovery partitions to before the primary partition. It should perform MBR to GPT conversion without data loss. It should also suggest to the user when disk partitions on a system drive are not in the recommended order of Microsoft the proper order and how to fix theirs. I would also like to see the a trimmed down version of the Revive app added so that a user could recover folders/files deleted accidentally. Further to Bob's comments about Tools, the Acronis VSS Doctor and Scheduler Manager should both be listed in the list of all tools, plus I second Bob's comments about better partition management features especially given how often we need to suggest using the MiniTool Partition Wizard to deal with issues arising from recovery or cloning where automatic resizing of partitions has not be actioned correctly (or at all!). The Acronis Rescue Media Builder tool should include a further option to create or update a Survival Kit instead of this just being shown when a Backup is being done to a removable drive, this should include greater control over creating the required 2GB FAT32 partition without any risk of losing data on the remainder of the drive (unless using an unsupported drive format). All the above; and provide the ability to nominate the Backup Account and Password (obfuscated when viewing the options but viewable when first entering the password) in the options settings. It was in some of the earlier versions I believe ? I'd like to see the WinPE rescue media builder option automatically detect OEM versions of drivers for storage controllers (IRST / RAID) and network devices and offer to include them automatically. At least 2 other backup products that I test with and compare against already offer this feature and it would be great to have the same functionality in Acronis too. This would be really beneficial for people with PCIE NVME drives set in RAID or RAID-on by the manufacturer, as well as those that have custom RAID controllers (rocket-raid and others) and/or custom network controllers that may not be found in the default Windows PE driver store. To compliment to Bobbo above, it would be nice to see the same functionality in Universal Restore as well. Driver issues are the number one problem in using UR that is posted in the True Image Forum. While were at it... perhaps it's also time automatically include True Image and UR in the same rescue media automatically if both are installed on the system at build. Then, it would be a one-shot for system drivers and a single rescue media build with the default Acronis WinPE/WinRE rescue media builder. + 1. I would suggest a further refinement of allowing only saved tasks to be included; no scan at all for local backups. When the load saved tasks option is selected, the save tasks should be automatically loaded when ATI user interface loads. The ability to save settings for Malware - existing save settings only relates to backup tasks. When uninstalling (or installing a new version using the full installer) users should be prompted with a choice of saving settings before the installer runs. Ditto to Ian regarding the Settings option to save these to a zip file - this should include all ATI settings for both Backup tasks, User preferences and AAP settings too. Ideally, it should also capture Activity history too. …... Ideally, it should also capture Activity history too. +1. The ability to disable scan for backups at startup (like it was in previous versions). Ability to comment on individual backup versions. of the previous day (v02) or earlier (v01). Whaat I would like to see is the ability to not install all the security stuff. I don't want it, and don't use it, as there arer better solutions. Now I have to go thru and turn all that stuff off. Show a checklist for the USB "power Off" options that shut down the external USB drives. Provide an AAP temporary exclusion. I just discovered that I've had Explorer exempt from AAP checking for months. I wanted it exempt for about 10 seconds. I would like the ability to set a specific schedule for certain backups (especially the cloud). And by this, I mean during a specific set of hours, in addition to the current schedule options. For instance. I'm about to embark on a third try to backup my entire photo and home movie folder to the cloud and it's 600GB in data. I've done this twice already (over the past couple of years) and the backup has become corrupted at some point making it impossible to keep using the same task (both times). With a 10Mbps upload limit from my ISP, and an average of about 5Mbps upload to the cloud shown in True Image, this is going to take a few days of 24/7 backup to complete the entire thing AGAIN, probably closer to a week. As the scheduling works now, once a backup task starts, it basically is going to run until it completes. During that time, none of my other scheduled backups (daily OS to local drive, daily OS to NAS and daily profile to the cloud) will be able to run on their normal schedules. So, to have a week long backup running 24/7, is not ideal since it's gong to prevent my other needed backups from having any opportunity to run unless I manually pause this backup. Yes, I can manually pause the cloud backup, but I'm not always physically at the computer where this can happen (I'm at work or just not available for other reasons). So, it would be nice if the Cloud backup could be configured to only run during a specific window (say from 11:00PM to 7:00AM) and not only automatically start at that time, but also pause itself when it hits the end of that time frame. That way, the other scheduled tasks can run without needing to have manual interaction and this long job can just run when there are no other scheduled backups or at least during a time frame where I know there would be minimal impact to other scheduled backup jobs. Ditto to Rob's post above but perhaps another option would be to allow the user to select whether more than one Backup task should be allowed to run, so that local backups could run concurrently with an active Cloud backup, akin to how many FTP clients allow the user to decide how many active downloads or uploads can be active. The should also be an option for tasks to only run when connected to the users home network (perhaps as identified by the local IP address used when the task was configured), or the destination location being on the same network, so as to avoid scheduled tasks trying to run when away from home and using foreign networks where data charges may apply. I'd also like to request that all recovery media options be logged either to the destination disk or to the recovery media if it is detected to be from a USB device. If nothing else, at least prompt the user if they would like to save the logs and where when the recovery media actions have been completed. 1) Currently, there is no log of any disk wiping - a log would show proof that it was completed which is required in some instances for hardware disposal. 2) The logs will be useful for forum and tech support assistance so they can verify what the user attempted to accomplish and/or what actually happened when they run into issues. 3) There have been several threads about UR causing driver issues? I was not aware that UR was being invoked under certain Cloning operations (https://forum.acronis.com/comment/489943#comment-489943). Is this true, and if so, the log should show if/when UR was restored. I would also like to see notifications / logging of any changes that are modifying something when cloning is being used. A clone should be a clone. If things are being modified (like applying UR automatically, for any reason), those should be identified. Otherwise, these should be separate actions that are selectable by the user and not automatically applied. If the UR thing is happening in some clones, that is making things worse in some cases - particularly when the clone is going right back into the same hardware and does not require UR to be applied at all. Ditto to Rob on the point about offering to save log data for rescue media actions - would definitely be helpful when looking at issues arising, even if the log was saved to the target drive being used in a temporary folder. Ditto also about the use of Universal Restore - this should also be an option offered to the user to choose, not applied automatically, especially when cloning. The option should offer a reason why UR should be considered but the final decision remain with the user. This way the user can test which method (with or without UR) works best for their use scenario. Not sure if this is feasible (given the limitations of Windows OS), but would appreciate consideration being given to it. Is it possible for a backup to be made to a partition that does not have a drive letter assigned to it by Windows. The rationale being that it makes it harder for malware to play havoc with backups. So rather than using a drive letter to identify the partition one would probably have to use disk number and partition number, or possibly the partition ID. The latter would allow for removable drives, whereas the former may be limited to internal drives. Ian, this is possible in a slightly different way today where it is reasonably easy to add / remove drive letters by a script run as a Pre Command (add drive letter) and Post Command (remove drive letter). I have uploaded such scripts to the MVP User Tools area on Google Drive for doing this for USB drives where users have wanted to connect and disconnect from the backup USB drive but leave the device physically attached. So it sounds like Acronis could make it a default option with a check box to remove the portable drive after backup without a separate script. That would be nice if it was a built in option that could be toggled on or off. Drive Volume name identification would be nice with out having to muck about with txt files and batch files so the backups only go to the intended drive, you could even write an id file to the destionation drive. The ability to create a disk clone on a partition rather than requiring a complete drive. 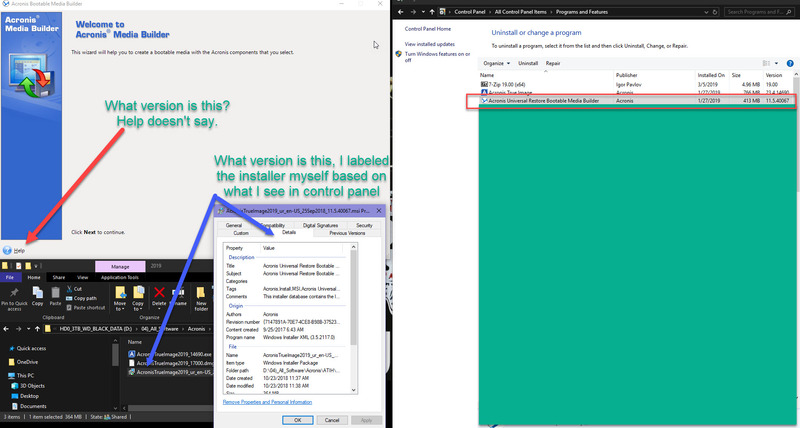 I purchased the upgrade to 2019 just for the ability to clone (so I didn't have to continue using a separate product for that), but I can't use it to clone to the partition where I currently keep my clone. With the large size of drives these days, requiring a dedicated drive for a clone of a much smaller internal laptop SSD is very wasteful. Marie, welcome to these public User Forums. Have you read KB 1540: Difference between Backup and Disk Clone? I have 2 disks in my laptop : Disk 1 contains my data and has 3 partitions. Disk 2 is an SSD disk and contains C as well as several rescue partitions. When I want to create a backup of my C partition the source selection screen shows the partitions on disk 1 but not those on disk 2. I knew Disk 2 contained other things than C so I did not check the disk but checked the C.
It now appears that all the Partitions on Disk 2 remained checked. I could only see this by selecting the option "whole partition list". On re-entering Acronis the whole partition list was again hidden. I would like to see NAS versions of Acronis for Synology, QNAP, etc, where the server would handle data deduplication across backup tasks and backup versions. and handle cloud backup of the NAS itself. Right now, I am still using Acronis for system disk backup to the Acronis Secure Zone when the computer has at least 2 disks, or to a local USB disk, in combination with Synology Active Backup for Business (SABP) which performs bare metal backups of the PCs. SABP has quite remarkable data deduplication resulting in dividing by 4 the amount of storage necessary to backup 5 PCs every day! I am using iDrive to backup the NAS data (excluding the PC backups) to the cloud. Unfortunately, iDrive doesn't support changed block tracking (CBT), and that is a pain when you backup big files like OST and PST files that change whenever you open Outlook. Acronis cloud backup is very efficient in that regards. So it would be great to have an integrated hybrid cloud backup solution for consumers/SOHO with excellent data deduplication and public cloud. I give a 1+ for Pat's suggestion, something I have suggested previously myself. Also please fix the version of SSL used by ATI which has been declared insecure for several years past, and provide SFTP / FTPS support for greater security for backups using FTP as this does not fit with enhancing the product with ransomware protection when some comms methods are so insecure. I don't currently use any ATI function using SSL/TLS (cloud access and email notification?) but I assume Steve's comment means that ATI still uses a deprecated SSL or early level of TLS. If so, Acronis should address that before implementing FTPS. It would be nice to have SFTP support regardless of the FTPS support. Hmm, I was not aware that ATI uses SSL. Is this reference to the MAC version or Cloud backup? If you are talking about FTPS which uses SSL/TLS, SSL is actually an old tech that at this point is obsolete. TLS is the actual Protocol for secure connections. TLS versions are 1.0, 1.1, 1.2 and 1.3. As with most protocols the lower/older the number, the less secure. TLS 1.0 is considered vulnerable and should be avoided. Versions 1.1, 1.2 and 1.3 are considered safe with TLS 1.3 the safest. Search for about:config in the address bar and press enter. Acknowledge the warning screen to proceed. In the search space, search for tls.version.max. Make sure the value for tls.version.max is 4. If not change the value to 4. The Padlock icon to the left of the address bar should be green and in lock position when on secure sites. left clicking the icon will display additional information. Search for Internet Options or Control Panel/Internet Options/Advanced tab. Tick Enable 1.2 if not already enabled. I am not familiar with the Chrome browser. I may have incorrectly read some old forum postings (and misread between the lines in Steve's comment). There were some references to ATI's email notifications failing when some ESP (gmail?) stopped supporting SSL. However, ATI's encryption option for email notification allows TLS. (I don't see mention of the level of TLS.) One of the options is "TLS if possible" which, I think, falls back to unencrypted if TLS is not supported. I know that is deprecated and highly discouraged, but you don't have to choose the option. The default Email Notification settings use insecure SSL with port 465 which stopped working with many ISP's who refused such connections. TLS with port 587 is usable but SSL is still offered despite Acronis publishing KB documents advising users how to get around the issues it has! KB 57875: Acronis True Image: E-mail Notifications to Gmail Fail with "Authentication failed"
KB 57895: Acronis True Image: E-mail Notifications to Yahoo or to Outlook/Live/Hotmail Fail with "An unknown error has occurred"
The point here is to ask: Why is Acronis True Image considered a 'less secure app' or using 'less secure sign in' methods? This does not compute with integrating anti-ransomware protection! I wish ATI had a option for each defined backup task that if selected would run a full backup and sort of "reset" the backup scheme for that backup task even though the defined scheme at that moment only calls for a differential or incremental. I find that from time to time I want to start the version chain all over again (usually due to massive changes). So for instance, let's say, I have a backup task set up to run a full every 15 differentials, but after just 5 differentials, it makes sense to start a new version chain now instead of waiting for 10 more differentials to run. Now I must delete and recreate the backup task to accomplish this. Ditto to Sandy's suggestion, perhaps a setting that would allow the user to set a maximum size for either a differential or incremental backup which would then start a new version chain. Something along the lines of: if diff or incr backup size exceeds 50% of the size of the initial Full backup, start a new chain! Yes, Acronis should fix this. I agree, but I think there should also be a "Start a new chain now" option regardless of the size of the backup. The user may have a reason that cannot be determined programmatically. I seem to recall that making changes to the backup scheme used to force creation of a new chain. Is that still the case? If so, a way to force a new chain now might be to change the defined number if incr / diff backups, then change it back. Patrick, I believe you would need to change the type of backup scheme to force a new full version, i.e. change from incremental to full or single version scheme, let it create the full version, then revert back to what you had previously. If you just change the number of incr / diff backups to be created before a new full, then my understanding is that this resets the count and then continues the current chain leading to even more incr / diff files in the chain! I agree that there should be an option to "Start a new chain now", or similar to avoid users having to 'mess about with' their working settings simply to circumvent a limitation of the application. Steve, in 2019, I believe the old behavior is fixed. At least in my testing it has been. I'm able to modify the Inc count higher or lower and it adheres to the chain count last saved without extending the existing current count and adding to it! It hasn't scoffed when I modify the retention count either so I'm happy about that! It would still be nice to run a full as needed without having to change the backup type or # of incs/diffs to make that happen. I'm less worried about modifying the script settings in 2019 than in previous versions though. Thanks Rob, haven't tested this behaviour for a while now! Thanks for posting a reply about the SSL certificate using port 465 email subject. Using port 587 and TLS (default for SMPT Standard today) is what a typical user will have in today's mail environment. If there are any Legacy port 465/SSL mail SMPT's still out there there shouldn't be! Have a look at the link provided for an in depth of SMPT ports and Protocols. In reference to Gmail and the "less secure apps". This is solely a Google thing. It refers from Google's two step or two factor authentication. That method of authentication is certainly secure but no more so than TLS over port 587. The reason that Google added the 2 step authentication model was because of mobile connection over unsecure networks. In this way access requires direct user interaction for authentication. Google views any app that will not allow or provide for this second interactive step by a user to access an account as "less secure". Obviously an app like True Image that sends a verification email cannot deal with a direct user interaction and work as designed so therefore you cannot use the 2 step method. This does not mean that True Image is a less secure app because of this however. Native bitlocker support for rescue media (manage-bde) which is available in WinPE. The MVP custom builder provides this and it works great. This way, people can use rescue media to unlock a disk and take offline backups. Native ISCSI support for rescue media (which is available in WinPE). Perhaps not important for all (or even most), but it is available in WinPE and easy to add. For those who do need/want it, make it an option at build when using ADK to build WinPE rescue media. Going back to recommendations for UR mentioned above, include better information about the UR installed version on PC (when you launch the application, there is no information about the version being used - you can check control panel installed applications, but the version shown there doesn't match the installer version) and available versions for those missing UR or that have an updated version they could be using instead. See attached screenshots. Nowhere, not even the account download does it show the current version of UR. It doesn't even make the list of supported products on https://www.acronis.com/en-us/support/updates/ so how do people know what the latest version is and when it's available?